Real Motion Processor combines Frame-Creation and High-Speed Processing for fluid motion reproduction (maximum processing rate: 120 Hz for the PTRS11k). Impressive 12,000 lm of brightness for the PT-RS11K. 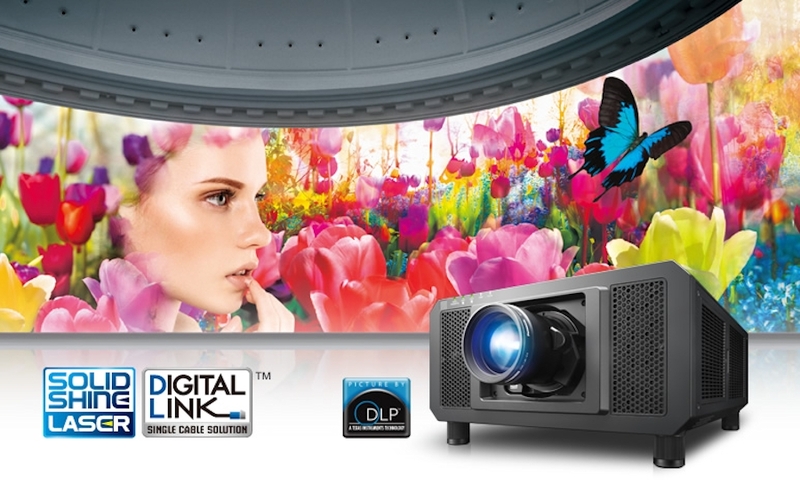 World's lightest 3-Chip DLP™ projector at 45 kg (99.2 lbs). Rec. 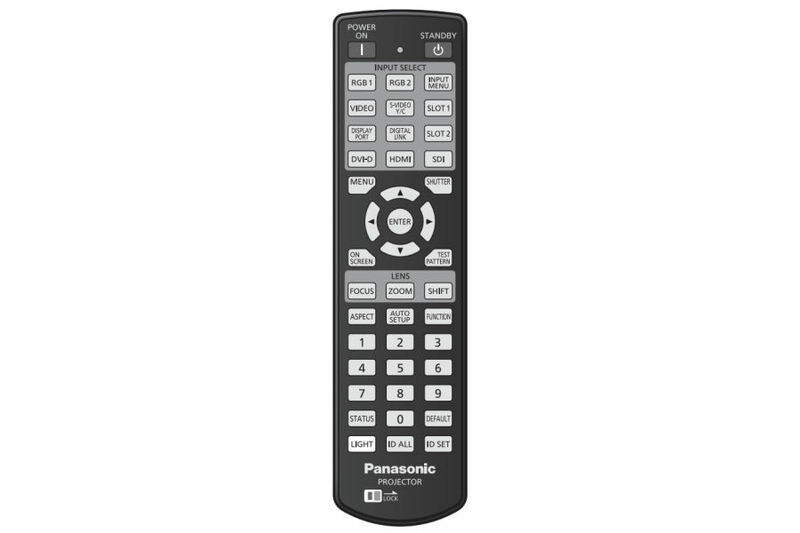 709 Mode reproduces colors accurately for HDTV projection. The PT-RS11K captures a more accurate Rec. 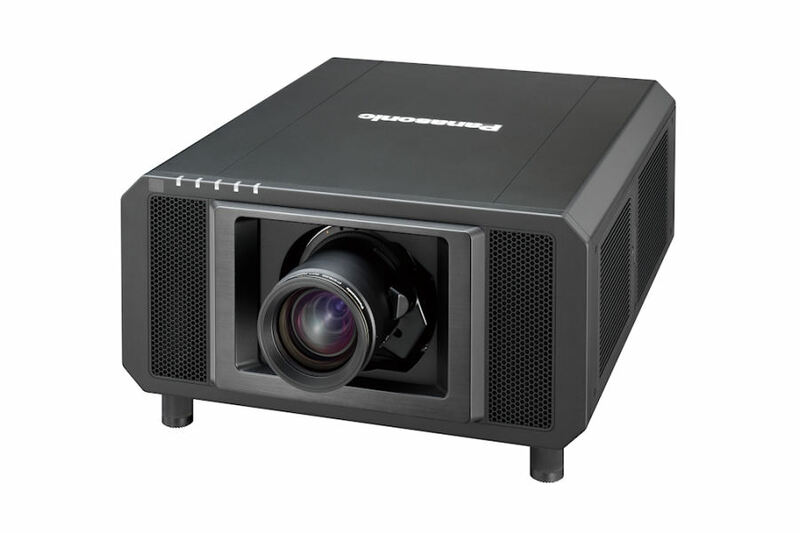 709-compliant color space than comparable laser projectors. 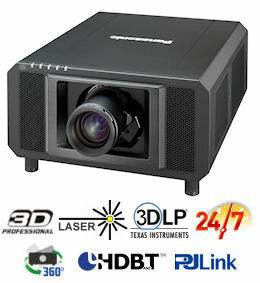 The PT-RS11K projector directly modulates laser power output to enable high contrast while reducing power consumption. 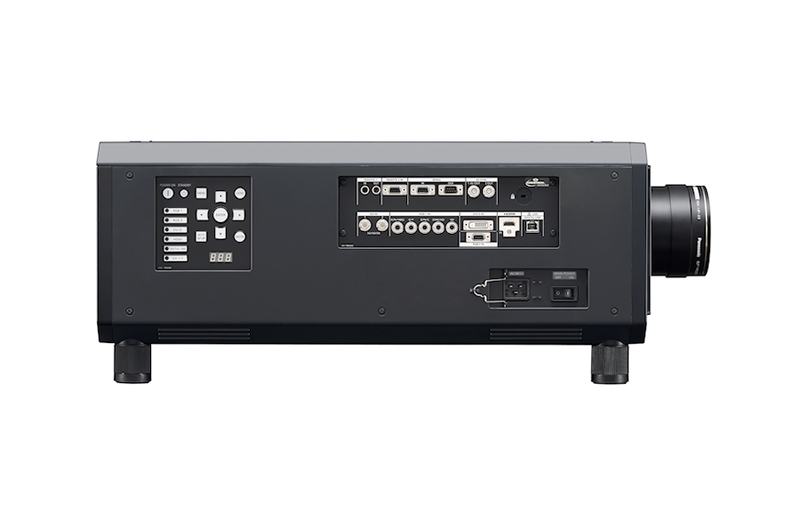 Digitally controlled frame-by-frame scene-linking modulation ensures highly precise light output adjustment, and accurate 20,000:1 contrast is achieved even when bright and dark scenes suddenly or frequently interchange. There is also almost no drop in contrast after extended use. Combining 3-Chip DLP™ imaging with Panasonic’s original SOLID SHINE Laser technology, the PT-RS11K achieves lifelike 1920x1200 resolution with a high 12,000 lm of brightness. Two powerful solid-state laser light-source modules and three independent DLP™ chips for red, green, and blue ensure outstanding brightness, color accuracy, and contrast. This proprietary technology optimizes image quality to improve color perception of images projected onto walls and other exotic surface materials (ideal for mapping applications) as well as in environments with bright ambient light. Combined with high 10,000 lm brightness, the PT-RS11K delivers clear and comfortable viewing in the most challenging applications. While the brightness of conventional lamp-based projectors drops rapidly due to age deterioration, laser light source brightness decreases gradually in a linear rather than exponential fashion. The PT-RS11K Series features brightness and color sensors to precisely optimize and maintain brightness for 20,000 hours*1 or more. In Normal Mode with maximum 12,000 lm brightness, PT-RS11K projector returns approximately 20,000 hours light-source service life. Eco Mode at 9,600 lm extends light source replacement to approximately 24,000 hours. These modes are suitable for roles in education or for signage applications. In environments where high brightness is not necessary, such as surveillance, control, and simulation rooms, constant operation modes extend light source replacement to up to 87,600 hours in Long Life 3 Mode—about 10 years of 24/7 projection—with consistent brightness and color. Large, pin-sharp images will not burn a hole in your pocket. Expect up to 20,000 hours maintenance-free service at full power with no filters to clean or replace*2 thanks to a fully sealed optical block. The PT RS11K projector has hermetically sealed laser modules, a long-life Eco Filter, and a new air-intake system to extend life and maintain picture quality in locations with dust contamination. SOLID SHINE Laser products exceed rigorous dustproofing requirements for operation in environments containing 0.150 mg of dust per cubic meter. 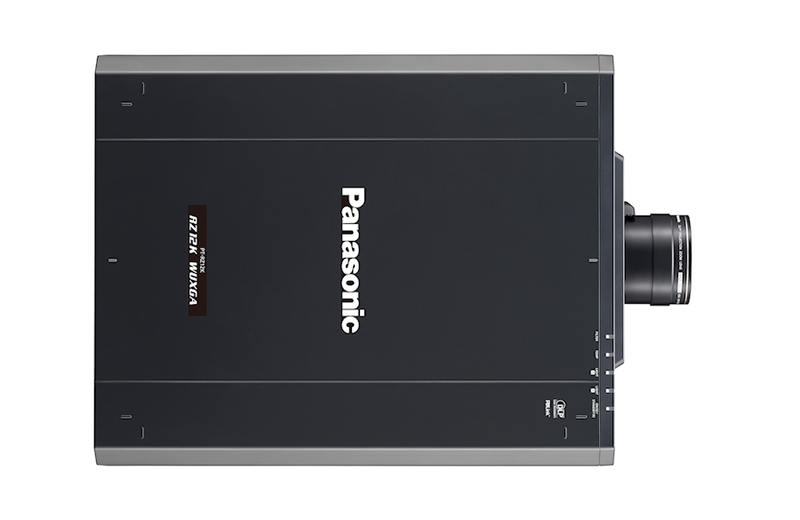 The Panasonic PT-RS11K employs a newly developed direct liquid cooling system for the laser light source that features a redesigned air intake and a solid aluminum heat sink to suppress temperature rises. This allows stable operation in ambient temperatures of up to 50 °C (122 °F)* while reducing operating noise to just 43 dB. 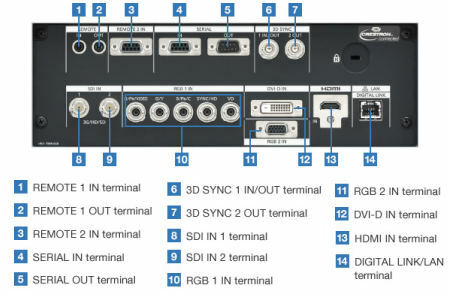 DIGITAL LINK supports transmission of uncompressed HD video, audio*1, and control commands through a single cable (CAT 5e or higher STP cable) for distances of up to 150 m (492 ft)*2. Add an optional DIGITAL LINK Switcher or Digital Interface Box to further simplify installation complexity in large venues while reducing cost and improving reliability at the same time. PTRS11K features a digital zoom function that allows images to be enlarged up to approximately 10 times (horizontally and vertically)*. Up to 100 units (10 x 10) can be edge-blended at a time to create large, multi-screen images. 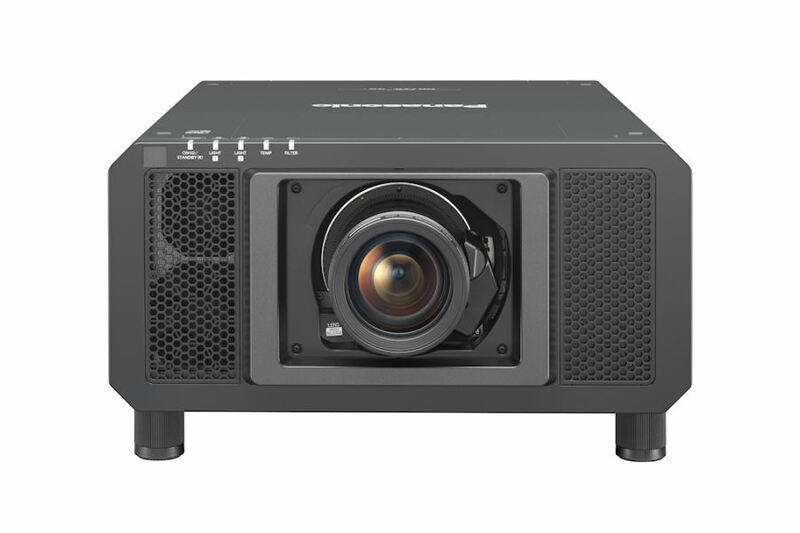 Mount the newly developed ET-D75LE90 Ultra-Short-Throw Lens onto supported Panasonic 3-Chip DLP™ projectors*2 and reduce projection distance by approximately 60% compared with our ET-D75LE50 Short-Throw Lens. This results in huge space savings and allows the high brightness and picture quality of the PT-RS11K to be exploited in smaller locations. The PT-RS11K Series is compatible with active 3D projection technology. It supports a separate, external 100/120/144 Hz drive, IR emitter, and active-shutter glasses, or an active filter and passive glasses for viewing 3D images. Lamps can blow, if you need your projector working and can't afford down time, you may need to keep a spare lamp. The replacement projector lamp for the Panasonic PT-RS11ke is the .